SAINT JOHN, N.B. -- Hunter Strand (Anchorage, Alaska) and Landon Slaggert (South Bend, Ind.) each tallied a goal and an assist as the U.S. National Under-17 Team defeated the Czech Republic, 5-1, in its first preliminary game at the 2018 World Under-17 Hockey Challenge at Harbour Station in New Brunswick. Dylan Peterson (Roseville, Calif.) opened up the scoring when he found the back of the net off a centering pass from Owen Gallatin (Hugo, Minn.) with 2:27 remaining in the first period, giving Team USA a one-goal advantage entering the first intermission. Team USA tallied three more goals throughout the second period. Tuch capitalized on a pass from Thomas Bordeleau (Houston, Texas) to score a short-handed goal 3:03 into the second period. Slaggert gave Team USA a three-goal lead at 9:45 with the help of Blake Biondi (Hermantown, Minn.) and Strand. Three minutes later, Strand sent home a pass from Eamon Powell (Marcellus, N.Y.) at the top of the left circle, before the Czech Republic netted their lone goal of the game, ending the second period with a score of 4-1. Closing the scoring, Matthew Beniers (Hingham, Mass.) put away a goal with 6:13 left in regulation, assisted by Brett Berard (E. Greenwich, R.I.). Drew Commesso (Norwell, Mass.) made 14 saves on 15 shots in the victory. 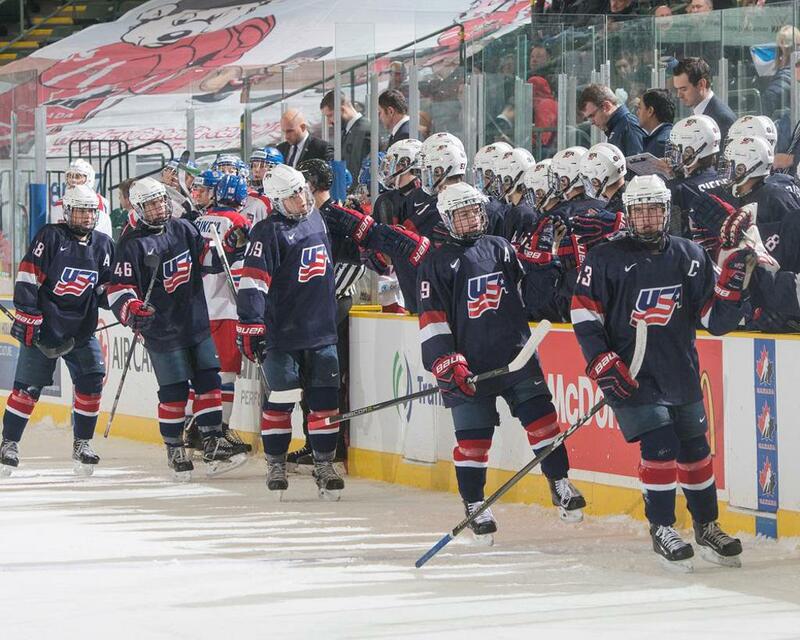 Team USA returns to action in preliminary play tomorrow (Nov. 5) when they face Canada White at 7:30 p.m. local/ 6:30 p.m. ET. NOTES: Matthew Beniers (Hingham, Mass.) was named U.S. Player of the Game ... All preliminary-round games, as well as quarterfinals and placement games, will be available via live stream on HockeyCanada.ca/WU17 … TSN will broadcast both semifinals, as well as the bronze- and gold-medal games in Canada … the official tournament website found here … The Team USA homepage for the 2018 World Under-17 Hockey Challenge can be found here … The 2018 World Under-17 Hockey Challenge includes two groups of four teams. Group A features Canada Black, Canada White, the Czech Republic, and the United States, while Group B includes Canada Red, Finland, Russia, and Sweden ... 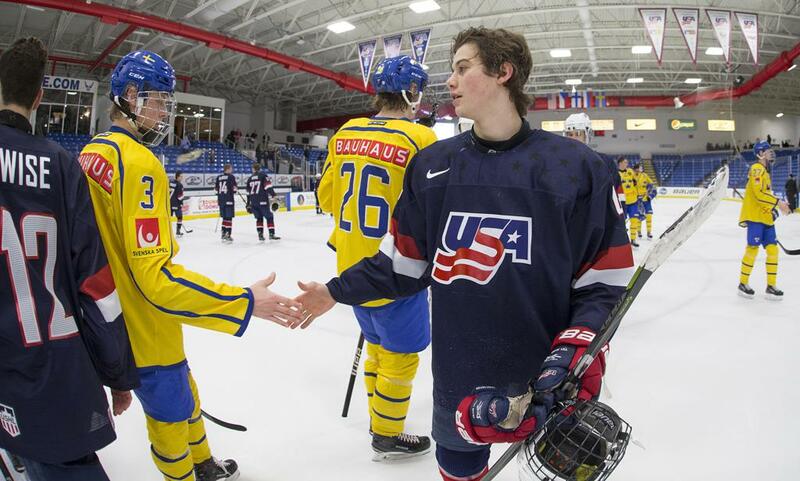 Follow @USAHockeyNTDP on Twitter for tournament updates and join the conversation on social media by using #WorldU17 … Seth Appert (Cottage Grove, Minn.) will lead the U.S. National Under-17 Team along with associate coach Nick Fohr (Grand Forks, N.D.), intern assistant coach Jared Nightingale (Jackson, Mich.) and goaltending coach Thomas Speer (Janesville, Wis.).